From ultra delectable Rattan dining areas to state-of-the-art statement barbecues, we have embraced sophisticated outdoor revelry with gusto. ‘Summertime and the living is easy’ and stylish, and luxurious.So now that the weather has thankfully taken a turn for the sunnier, it’s time to take all that entertaining and partying (and even just plain old relaxing) that we do so well outside. The rise in open-air entertaining has been one of the key UK consumer trends of modern times. And pleasingly,this increasing desire for al fresco good times has been fuelled by decadence and elegance as much as function and form. From ultra delectable Rattan dining areas to state-of-the-art statement barbecues, we have embraced sophisticated outdoor revelry with gusto. It’s a trend that leading high-street retailer Robert Dyas recognises. To kick off the summer party season with a stylish bang, it has put together a range of must-have swanky outdoor summer essentials. Any alfresco celebration worth its party popper has to start with the ultimate in outdoor dining. 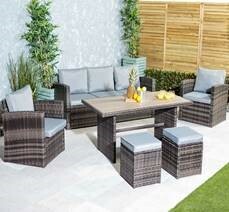 Sumptuous summertime satisfaction doesn’t get any more charming than this Maze Rattan LA 6-Seat Rectangular Dining Set with Ice Bucket and Parasol (£899.99). Just as classy as this Monaco 6-Seater Rattan Outdoor Dining Set (£674.00) and when the revellers have gone home this will really double up for some luscious laidback lounging. Talking of unwinding, this Maze Rattan Tulip Daybed (£999.99) not only takes the breath away with its stylish aesthetics, it will soothe your breathing for maximum horizontal vibes. Another way to ensure satisfying outdoor peace is this Charles Bentley Wooden Arc Hammock (£189.99). If you prefer your garden furniture to embody some hardy values (often needed in a British summer) this Robert Dyas Country Hardwood 6-Seater FSC Wood Garden Furniture Set(£269.99) should do the trick. Additonally, this Farwell 3m Pergola with Protective Cover (£279.99) will keep the elements at bay - whatever the weather throws at you. Long gone are the days when a barbecue resembled a robot’s face chopped in half and hastily assembled atop a wonky tripod. Today, barbecues are big business as this Outback Meteor 6-Burner Gas BBQ with Multi Cook Plate System - Stainless Steel (£449.99) demonstrates. Not only can you griddle or grill your burgers, it even comes with a pizza stone. If you can’t decide between the convenience of a gas barbecue or the traditional flavours of a charcoal grill, don’t fret. Just plump for this versatile Outback Duel Fuel 2-Burner Gas and Charcoal Trolley BBQ with Multi Cook Plate System (£374.99) instead. Gas and charcoal - it does both! Those looking for a more stripped-back barbecue should consider this Outback Full-Drum Charcoal BBQ with Quad Grill (£179.99). The unique drum design looks great and means it can cater for parties where extra guests put in appearance. The Outback Excel 310 2-Burner Gas BBQ Trolley with Side Burner (£139.99) is another affordable winner - and Robert Dyas’s best sellers. The futuristic design incorporates a thermometer in the lid meaning you can use it as a convection oven for larger cuts of meat. Every outdoor party needs music. Avoid the stress of setting up your decks, amp and speakers outside, and go for this hassle-free JBL PULSE3 Portable Waterproof Bluetooth Speaker with LED Light Show(£199.99 (online only) instead. The light show will have you reaching for the stars! Of course, even the most glorious of British summers will come with a drop of inclement weather. So when the temperature drops this La Hacienda Grey Series Standing Outdoor Heater - Large (£129.99) patio heater or this La Hacienda Steel Enamelled Fire Pit and BBQ(£49.99) will come in handy. When night falls, there’s no need to take the festivities inside. Some expertly pointed outdoor lighting is what you need. This battery operated Smart Garden Rustic Table Top Lantern (£19.99) will never let you down. While this sleek Lawrence 2-Light Outdoor Porch Wall Light (£34.99) will provide a touch of modernist style. This flexible Smart Solar 100 LED Light (£12.99) will provide both decoration and mood-enhancing qualities when things turn dark. As will these Smart Solar Classic Majestic Solar-Powered Stake Light(Pack of 5 (£19.99). Just remember to keep the insects at bay with these fragrant Incognito Insect Repellent Incense Sticks (£4.79). This press release was distributed by ResponseSource Press Release Wire on behalf of Robert Dyas in the following categories: Men's Interest, Leisure & Hobbies, Home & Garden, Women's Interest & Beauty, Food & Drink, for more information visit https://pressreleasewire.responsesource.com/about.